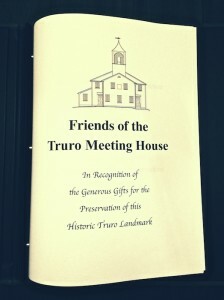 The Friends of the Truro Meeting House, a non-sectarian, 501 (c) (3) organization, is dedicated solely to the preservation of Truro’s oldest landmark, not merely as a resilient reminder of the town’s past but as a welcoming gathering place for the entire community. 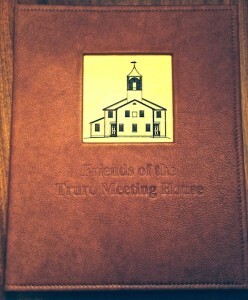 THANK YOU, to all 160 of you who have become members of the Friends of the Truro Meeting House. Thanks, too, to the Community Preservation Committee and the citizens of Truro for supporting the restoration of the Meeting House so generously. 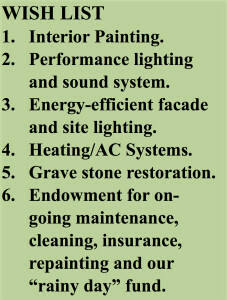 It is a challenge that we hope will make the building secure for generations to come. If you haven’t yet contributed this year, please do so now by clicking the PayPal Donate button or by sending a check by mail. However, the Town funds do not cover maintenance and other such expenses (see WISH LIST), and this is where the Friends are needed. Please join or renew as a member of the Friends either at the basic levels of $25 for individuals or $45 for families. If you can, we do hope you will consider making a larger contribution. So far we have raised over $51,605, which has funded exterior and interior painting of the Meeting House, new light fixtures, keeping the Meeting House fit for our events, preparing a topographic site survey, and an accessibility plan that meets the Massachusetts Architectural Access Board’s requirements, yet seeks certain variances to maintain the historic character of the building and site, and funding an expert evaluation of our historic Paul Revere Foundry Bell. 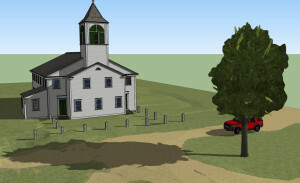 PLUS, your financial support and your attendance at our expanded roster of community events are sending an important message to town officials and our fellow citizens that the Friends is giving the Meeting House a new face as not only a place of worship but as a place for concerts, talks, poetry readings and more, whose beauty and history are shared by everyone. The Friends is an important reason why the Town supports the Meeting House through its Community Preservation Act funding. Members are listed in our Donor Recognition book on display at the Meeting House. They also receive a Newsletter twice each year to keep everyone updated on progress; a schedule of events; and an invitation to the Annual Meeting. Know that you have our deepest gratitude for your support. We look forward to seeing you at the Meeting House.